French painter born in Montbéliard in 1590, died in Toulouse ca. 1638. He worked for in Rome between 1619-1626, becoming one of a group of painters influenced by Caravaggio, including Georges de la Tour and Bartolomeo Manfredi. These Caravaggist painters imitated their mentor’s use of dark and light, expressive gestures, and group scenes. After 1626 Tournier returned to live in southern France. I became interested in him because of a strange coincidence. I had written a third of the book, had randomly chosen the Tournier name for my characters as well as the locations and a certain obsession with the blue used in the Virgin Mary’s robes. 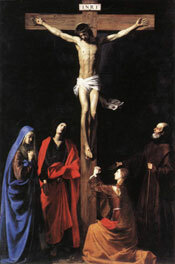 One day I was walking through the Louvre and saw a huge painting of the Crucifixion. The Virgin Mary is wearing a particularly striking blue robe, and I thought, “Ah, there’s the blue I’ve been writing about.” I went up to the painting to see who had painted it, and found it was by Nicolas Tournier. I had never heard of him, but he had the same last name as my characters and used the Virgin blue to dramatic effect. Not only that – I then discovered he was born only 30 miles from Moutier, where the Tourniers end up, and died in Toulouse, just 30 miles from where the modern character Ella Turner lives. And his birth date fit – he could have been Jacob Tournier’s son, and Isabelle Tournier’s grandson. I couldn’t resist – I added him to the story, and I had Jacob head west at the end, towards Nicolas Tournier’s birthplace Montbéliard. Of course, he isn’t related to my characters – we know his father was one André Tournier. But he becomes part of Ella’s obsession, where she tries hard to find concrete things that connect herself to the past.